My three months of Jake post is way overdue. Amazing milestones have occurred like.....you know....rolling over....pulling on mama's hair....marilyn monroe-esque cute cooing....giggles....and jake has discovered girls....oh my. Happy Birthday Jake! You are 10 weeks old today! During the past six weeks since my last update there have been a lot of noteworthy events in your life. Before you turned six weeks old we gave you your first bottle of expressed milk and have given you a bottle or two every week since. You have had absolutely no trouble switching between breast and bottle, which is a relief since I had been worried about that. 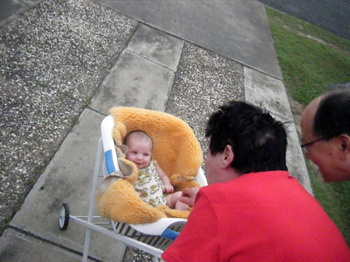 Before your seven week birthday you took your first international flight from Tokyo to Brisbane, Australia. We were a bit worried how things would go but you loved your little baby bassinet on the plane and charmed all of the older Japanese ladies on board. Your dad and I even managed to watch a whole movie without you waking up!! You have now met the Australian side of your family and it has been great having the support and love of our family nearby. I hope you don't mind but we left you in the capable hands of your Aunty Neen for the night so we could go to our friend Martine's birthday party and we even got a little bit drunk - yay! One of the most exciting developments has been watching you fall into a schedule of sorts. As soon as we landed in Australia you started going to bed around 7pm and sleeping through until 1 or 2am. You still wake up a couple of times in the night but they are usually short and sweet and it's not difficult getting you back to sleep. Oh and did I mention the smiles. You are a happy baby who is not shy about sharing his smiles. It seriously makes our day. Everyone comments how cute you are and how alert you are for your age. It has really been a pleasure to watch you grow these first ten weeks. We weighed you at the baby store a couple of days ago and you have been consistently gaining about 30 grams a day and you now weigh in at 6290 grams. You are strong, especially your legs and neck. You hold your head up easily. BTW, your saliva glands have kicked in and you slobber everywhere - it's cute. Also now you do all of that cute baby talk that you hear about before you have a baby!! You really do say 'ah-goo'. You have been a champion when it comes to dealing with the summer heat even though this summer has been much cooler than usual. Last week we celebrated your first Christmas and man did you clean up!! Presents galore. You also had your photo taken with Santa for the first time, but you were fast asleep!! If you are wondering what contraption you are sitting in....it's nanna and poppy's laundry basket lined with Uncle Chris's sheepskin from when he was a baby. Although I had my doubts, you love it and fall asleep for nanna and poppy every time. Jake, your dad and I can't wait to watch you grow up, but at the same time we are trying to savour these moments when you are so small and fit snugly in our arms. 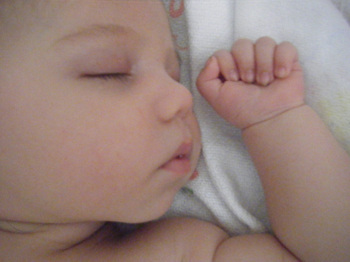 You are already showing signs that you'll be rolling over before long (scary thought), so if you can slow it down a little because we love our little baby. I think I've covered most of the biggest developments we've seen over the past six weeks and that brings us to the end of 2007. It'll always be a special year for me because it was the year you came into our lives and changed them for the better. Always remember that we love you so much it hurts! Wow where do I start? Going from being pregnant to becoming a mum happened so quickly (relatively) after waiting for so long. Thank you all so much for your congratulations. We are completely in love with our newborn, Jake Taiga (aka Dudley - I found myself calling him just that for most of the first week - whoops) and are doing pretty well all things considered. This whole pregnancy, birth, baby experience has proven to me how amazing mother nature really is. 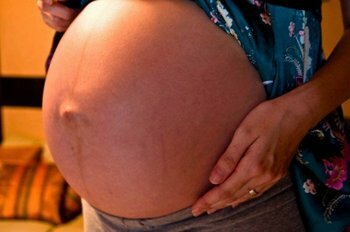 By the time you are ready to give birth, you are sick of being pregnant and before you have any time to reflect on how tough labour and delivery really was, mother nature presents you with a little baby that needs all of your attention. Forget having any time to reflect on the pain....except for maybe the day after. 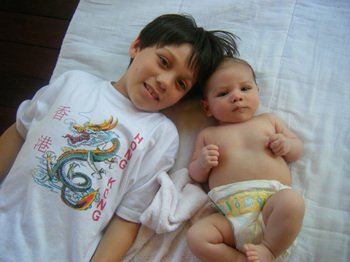 I'd really like to share Jake's birth story because I love reading everyone else's birth stories and of course for myself and Jake when he gets older. So how did Project Dudley come to completion?? Click if you want the gory details. I should have known that my son would take his time to arrive on the scene. 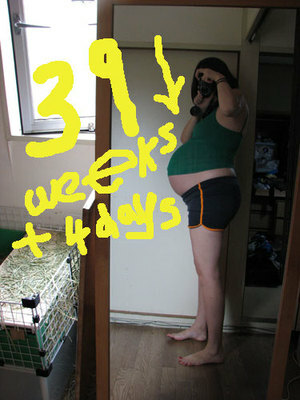 It's ok though I'm only two days past my due date so far, so that's not too bad. I have to go and see the doctor in a couple of days to see how dudley is doing, but I hope he comes in the next couple of days. There is only one lady checked into the maternity clinic right now so if we were to have the baby, we'd pretty much have the place to ourselves...that'd be nice. So now I feel completely in limbo. I went and bought some labour-inducing massage oil today....but no results yet. We will be doing everything to avoid any kind of artificial induction. 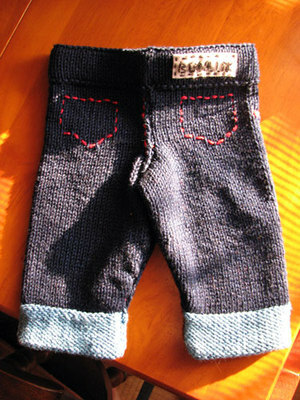 I finished the Bella baby pants and am really happy with the result. I think they might be a little too warm though - they are thick. 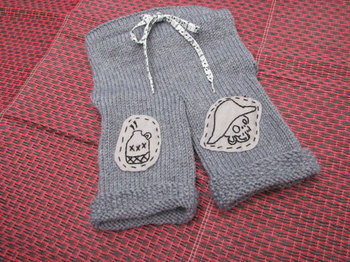 I added some embroidered felt patches on the knee using a couple of Jenny Hart's awesome Sublime Stitching embroidery patterns. I also decided to forgo the knitted i-cord drawstring for a cute shoelace and also went with seed stitch leg cuffs so you can adjust the length of the pants. 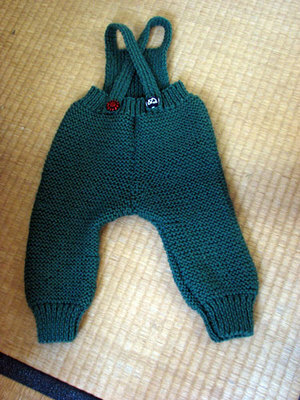 Definitely recommend the pattern - cute baby pants that knit up quickly. We also got in some baby practice. 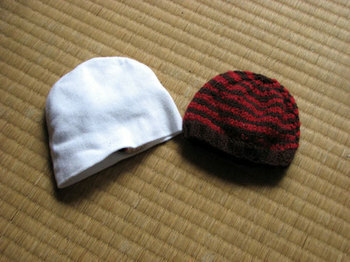 Our friend Kyoko came to visit with her 10-month old baby, So-kun. We can only hope that Dudley will be just as cute with an equally sweet disposition. 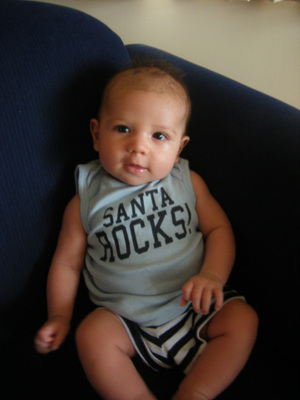 He's gorgeous and will make you want a baby.....if you don't already have one. I'm so ready to move on to the next stage. It's been wonderful having four weeks of relaxing, baking, doing 'lunch', getting massages, pedicures, my hair done and not working but I'm ready to move on. I really want to meet Dudley and if he stays in there much longer he'll have more knitted clothes than any other baby I know of. They are coming off the needles at a fast pace right now. 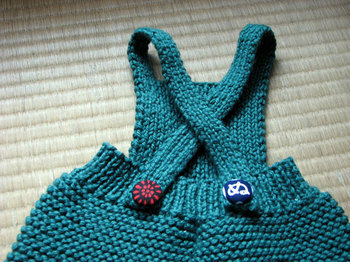 I'm keen to knit this vest from a new Japanese knitting book for myself, but I need to adjust the pattern and with this gigantic belly....it's just not possible. 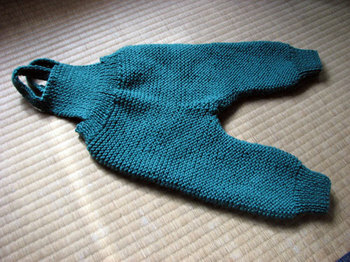 So what have I been knitting?! Well baby clothes of course. I started the Knitty blu jeans in July people and finished the knitting part of the project in a couple of days but the finishing was daunting so I just put the pieces away. Last week I finally washed the pieces to shrink them and bought some elastic for the waist and sat down and seamed those darned jeans. They turned out pretty darned cute! 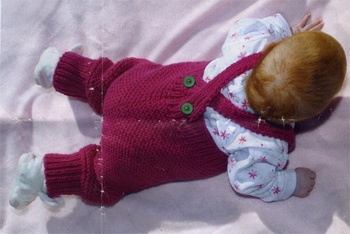 Another cute project that I just HAD to make were these cute baby overalls that I found in the Australian Creative Knitting Annual from 2004. I used some furoshiki covered buttons that I bought at a great furoshiki shop in Harajuku (it's at the bottom of the Ukiyo-e Museum). 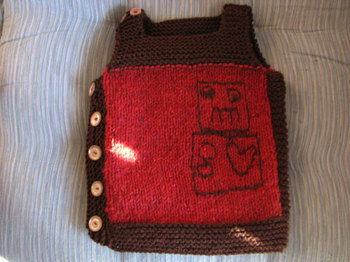 Ooh and then I discovered the Thrifty Knitter's baby vest pattern, Pebble and decided that I definitely wanted to make it. I wanted to use the one ball of Rowan felted tweed that I had in my stash but I knew it wouldn't be enough yarn to complete the vest so I had to do it in two colours which meant having to knit the vest up a little differently. 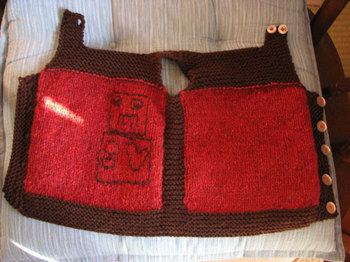 I did it pretty much the same but had to pick up stitches for the button borders. I also added some bendall robot embroidery because I felt inspried. I had a little bit of yarn left over so I also made a matching baby beanie but it's TINY (photographed with a tiny cotton newborn beanie which looks big next to my beanie). 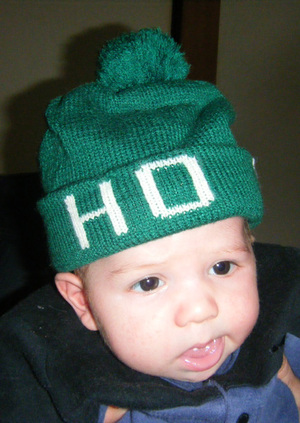 I don't think any son of mine will have a head that small even as a newborn....oh well. 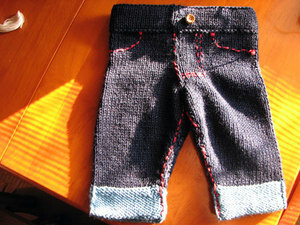 I've also finished a pair of these Bella Knitting baby pants but have yet to take a photo. And I think this baby viking hat will be next on my list as well as a pair of matching socks for Dudley and myself.Ok so that's my craft round up of the past few weeks. 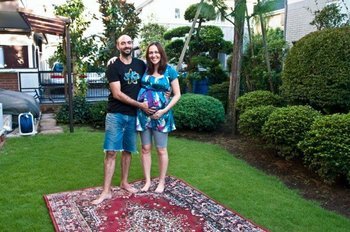 I would like to write a summary of what it's been like to be pregnant in Japan (not that I really know what it's like to be pregnant anywhere else), but we'll see if Dudley gives me any more FREE time. Off to eat breakfast now and pysche myself up.....hopefully my next post will include details of my most amazing FO ever. 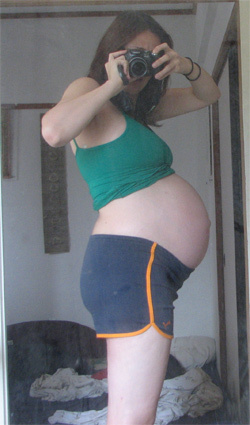 Hey I'm still here people and I'm still pregnant (38.5 weeks). I have some knitting to show you but will have to take the photos tomorrow. I quickly wanted to share a video I took recently of my belly in action. I wanted to edit it and make it shorter since all the action occurs in the first 20 seconds, but didn't know how. So feel free to stop the video after 20 seconds unless you'd like to watch my belly and listen to the movie we were watching (can you tell what it was??). Dudley in action from kat on Vimeo. Thank you all so much for your suggestions in the last post. I reread the comments many times and I think we are nearly organized...um, sort of. 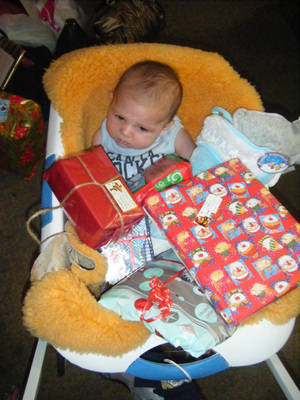 I have the mental list prepared and we have nappies and wipes so if he comes early we have the basic items ready. Darin and I also took a breastfeeding and parenting class which was very insightful and helpful too. My last day at work was last Friday and since it has been a long weekend, it still hasn't sunken in that I don't have to go to work tomorrow or any other day that matter for the next six or so months. Really??!! That feels great. Dudley is getting bigger and heavier and has been experiencing hiccups pretty often...now that's cute. Evidence of the growing is shown in photos below. and the next photo is courtesy of Martine! Beware - it showcases a lot of belly! Yesterday our sweet friend Martine hosted a baby shower for dudley, darin and I. We had a great time spending the hot, hot afternoon with friends enjoying good food and conversation with friends. We also scored some pretty amazing stuff for dudley and darin was lucky enough to score a superdad tshirt (shown in photo below) from C&J.....he hasn't taken it off since he got it! You can see other photos from the shower on Frangipani. And seriously I have been knitting, but I haven't fully completed anything apart from these great booties. Does anyone need another reason to have a baby??!! 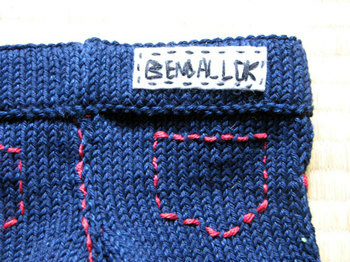 Pattern by Brooklyn Handmade. Made using Cascade Fixation and Pima Tencel. That's 52 days, which kinda sounds like a lot and at the same time nothing at all. 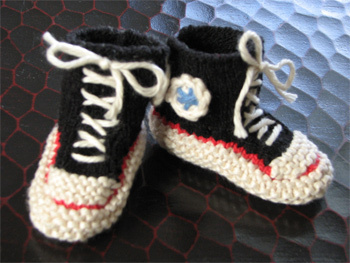 First a shout out to new mother and all round rocking crafty gal Pinn (also one of the founding Tokyo SNB members) who had her baby girl, Mari in Thailand on 15 August. Congrats to Pinn and Seimi!! I can't wait for you guys to visit Tokyo!! I've decided though that I need to get organized sooner rather than later. Preparations have begun. We bought a combo chest of drawers/change table from Ikea and Darin is working on some cute animal decorations to keep Dudley amused while being changed. 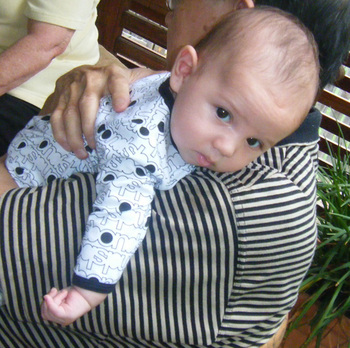 We also have quite a lot of baby clothes, which still need to be washed (do you need special washing detergent?). I also bought a 2nd hand rocking chair on the weekend. It is so nice to finally have a chair and be off the floor sometimes....western people who live on tatami will know what I mean. So I need some advice from all you mothers out there. What else do I need to buy? Or what items did you find useful or a waste of money in those first few weeks. I think I'll be buying disposable nappies from Costco - how many do you need?? As you see I have a lot of questions. We don't have a lot of space so I don't want to overbuy, but I also don't want to be stuck without essentials as we don't have a car and can't just pop out to get stuff like in the western world especially in those first few weeks. my tentative list: nappies, wipes, some kind of cream?, baby bath, breast pump?, baby sling/baby bjorn, some kind of rocker thing?, some kind of magic bin that keeps bad poo smells on the inside... Hmm, that's all about I can think of right now. Help, please. Holy moly time is flying. Thanks for your well wishes for Sugar! We've taken her back to the vet and he seems to think it could be cancer, but I'm not convinced. He said there is surgery they can do but it is risky for small animals with only a 30% success rate. That is just too low. We just wish her leg wound would heal up - it's heartbreaking to see a gaping bloody hole in your guinea pig's leg/rump. She is acting pretty normal, though she isn't nearly as active as usual - this also might have something to do with the fact that it has been 34 degrees everyday for the last week. Pigs don't do well in the heat.....just like pregnant women. Ha! So I'm 30 weeks and I'm feeling it baby. I have some back pain when sitting at my desk for long periods of time, but the worst is the hip pain I get when sleeping on my side. We've added another futon but it doesn't seem to make a difference. Apart from that though I feel pretty good and have just been taking it easy. I walk slowly. We've bought a couple of baby items and their physical presence in our apartment was shocking at first - we really are going to have a baby!! I'm at my happiest now when swimming at the gym. I never want to get out of that pool. I'll be sad when I have to quit the gym at either the end of August or middle of September when my maternity leave begins (my gym is near my work). Luckily I'm pretty much only working four day weeks now and get to finish at 4:30pm. It is very helpful in avoiding rush hour crowds on the trains. Ok, it's 4:28pm now so it's time to leave work. I'm finding that I have a lot more stains on the belly portion of my clothes. Did I drop this much food before and did it fall to the floor? 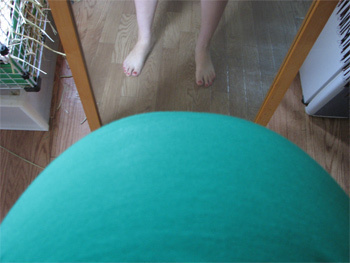 My belly is so big now that it catches food that falls from my mouth. That seems to happen a lot and it's pretty embarassing to be brushing crumbs off your belly after each meal. 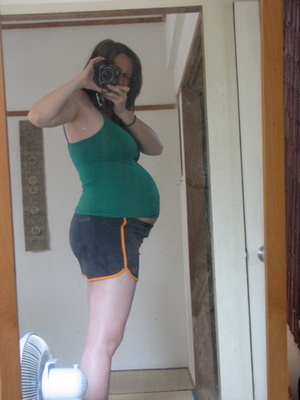 In other belly news, my mother notified me yesterday that when she was pregnant with my 5lb something sister, her belly grew to a circumference of TWO METRES. Holy crap! That's the bad news. The good news is that even at that size she didn't get stretch marks on her belly.